This tour is no longer operating, please visit Brazil Cruises to browse options for cruises from/to Manaus. Arrive in Rio for your stay, located on Copacabana Beach. Enjoy the rest of the day in this wonderful city. …the city, located at the confluence of the Amazon and the Tapajos rivers. On arrival, the cruise director welcomes you on board the Amazon Dream. You settle into your cabin. Smiles are everywhere, music is playing somewhere, you are in Amazonia. Drinking fruit juices with amazing flavours, you meet the crew. Your guide presents the cruise itinerary and gives a few explanations concerning the logbook. The Amazon Dream casts off and glides gently towards the confluence. For miles, the blue waters of the Tapajos interlace with the yellow waters of the Amazon without merging, as in a vast piece of lace. It’s one of the favorite playgrounds of the pink dolphins (boto) and the grey dolphins (tucuxi). One last glance at this amazing scene and you cruise towards the mouth of the of the Ituqui river, a channel parallel to Amazon. (3 hours). Sunset and drinks on the third bridge, Short presentation by the guide about the next day and the area where the boat has made its moorings. First contact with the noises, the cries and murmurs of the Amazon Rain Forest. We stop for the night at the mouth of the Ituqui. …motorboats to observe birds and flora with your guide on the Maica Lake, followed by Piranha fishing. Everyone receives a fishing rod, bait, and follows the sailors’ advice to try their hands at one of the main activities in this place: fishing. After returning to the ship, we cruise by Ituqui River and the Amazon River toward the mouth of the Curua Una River (3h). Sunset and drinks on the third bridge, then a short presentation by the guide, explaining the next day and the area where the boat has made its moorings. Overnight at the mouth of the Curua Una River. …navigation takes us towards the village of Pacoval on the Curua-Una River. This little village provides a singular example of everyday life in Amazonia. You visit the community “Quilombolas” (descendants of African slaves in the 18th century, refugees in the Amazon) and meet with the local people. We then cross over the Amazon River in the direction of Santarem. On the river banks, you can see the houses on stilts of the caboclos, the “water people”, a population descended from the mix of Indigenous peoples and their Portuguese conquerors in the 16th and 17th centuries. The evening finishes with a short presentation by the guide about the next day and the area where the boat has made its moorings. Overnight in the Piapo Chanel, near of the Monte Alegre Lake. …terminal. You visit the town and discover its herbalists, harbour bazaars, stalls selling multicoloured hammocks, and its inhabitants’ hectic life. Back on board the Amazon Dream and navigation towards Alter do Chao, the “Caribbean in the heart of Amazonia”. Dropping anchor at the tip of Cururu or near the green lake; a local Indian legend has it that a magic stone hidden at the bottom of the lake gives it this extraordinary blue- green luminescence. After a well-earned sunset drink, our guide will give a short presentation regarding the next day’s activities and the area where the boat has made its moorings. Overnight in Alter do Chao. …world. We then board motorboats with our guide to explore the green lake and the “Enchanted forest”. Late in the morning, visit the village and its Indian handicrafts and caboclo shops. In the afternoon we navigate towards the mouth of the Jari River. This small tributary linking the Amazon to the Tapajos River is bursting with dolphins, birds, and caimans. Here we drop anchor and the guide gives a brief outline of the next day’s program and the local region. Overnight at the river mouth of the Jari. …lunch, we navigate to Icuxi Bank, on the Arapiuns River. Here we have the chance to bathe in the Arapiuns waters. Evening navigation toward the d’Urucureá cove (45 mins). Overnight in Urucurea cove. …the Tapajos National Forest. The boat weighs anchor and navigates on the blue waters of the Tapajos which, at that point, is over 20 kilometers (12 miles) wide. A new ecosystem, new riverscapes and landscapes: here begins a new cruise into the heart of the Amazon as you have never imagined it, where white sand beaches (from August to January) and lakes make up a magnificent setting. Short presentation by the guide regarding the next day’s activities and the area where the boat has made its moorings. …blue butterflies, and maybe even a glimpse of agile monkeys and sloths. After the long walk, we return to the boat for swimming and relaxation. After lunch, we coast down the right bank of the river to Lake Marai (2hrs). We are on the trail of the expedition Langsdorff, close to one of the villages of the Munduruku Indians, painted by Florence in 1828. Their descendants, anxious to preserve and make known their traditions, open their doors to receive visitors under ecotourism programs. At dusk, we board the motorboast on the Bragança lake for bird watching at the sunset. Short presentation by the guide about the next day and the area where the boat has made its moorings. Munduruku ritual. …flour, which forms the basic ingredient in all local dishes. We observe the local fauna and flora while canoeing down an Iguarapé, a little river that meanders through the forest. Aftenoon navigation towards Alter do Chao for our final night in the heart of the Amazonian forest. After breakfast, we say goodbye to the Amazon. 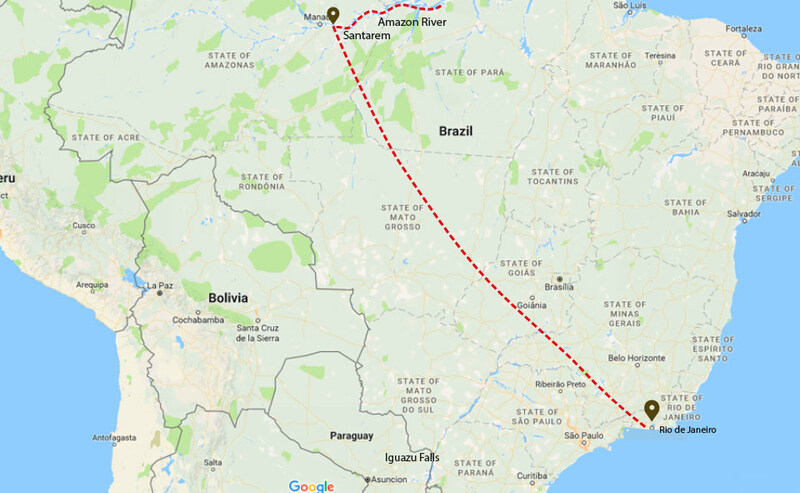 Disembarkation at Alter do Chao and transfer to Santarem airport or navigation towards Santarem, depending on the return flight schedule.